How I got started: My father owned a printing company. One of my first memories of it was going in there and playing with the giant books of wedding invitations. When it came time to replace one of the books, he would bring the old ones home for me. While most children play store, or school, I was playing wedding invitation consultant. I started working there right of out of high school in between college classes. I got started filing negatives, delivering giant boxes of printing to different places, getting lunch for my colleagues, and shipping things. I started at the bottom. I hated it then, and I did it for years! But now I look back and I appreciate my dad so much for starting me there. I remember the first couple I met with. I was still in my teens! Immediately I was drawn to them. I loved getting to know them, hearing how they met. And I thought, this is what I want to do. Before I knew it, it was a full time job and I have been doing it ever since! My favorite thing is asking these couples how they met. I have heard it all! Some of the most unique invitations I have done: I absolutely love themed weddings. Some of the most unique themes I have done are Harry Potter, Star Wars, and Twilight themes. For other occasions I specialize in dog theme invites. Puppy showers, puppy birthday parties, you name it I do it. My love of dogs always shows in these invites. My advice for couples tying the knot looking for invitations would be: Once you set your date and times, start looking and ordering. It is one thing you can do early on and one less thing to stress over. Utilize your maids! That is what they are there for. Have a girls night, get some wine and take out, and have an envelope stuffing party! There are plenty of ways to make it fun so your maids won’t feel overwhelmed. Invitations by Tracey is a division of S & M Press, Inc. S & M has been listed in the Inc 500. Certified dealer for Carlson Craft & Birchcraft. Winner of the Carlson Craft distinguished dealer award for ten years straight. Invitations by Tracey – Your one stop shop for your printing needs – Business cards, letterheads, envelopes, brochures, folders, flyers, direct mailers and more. 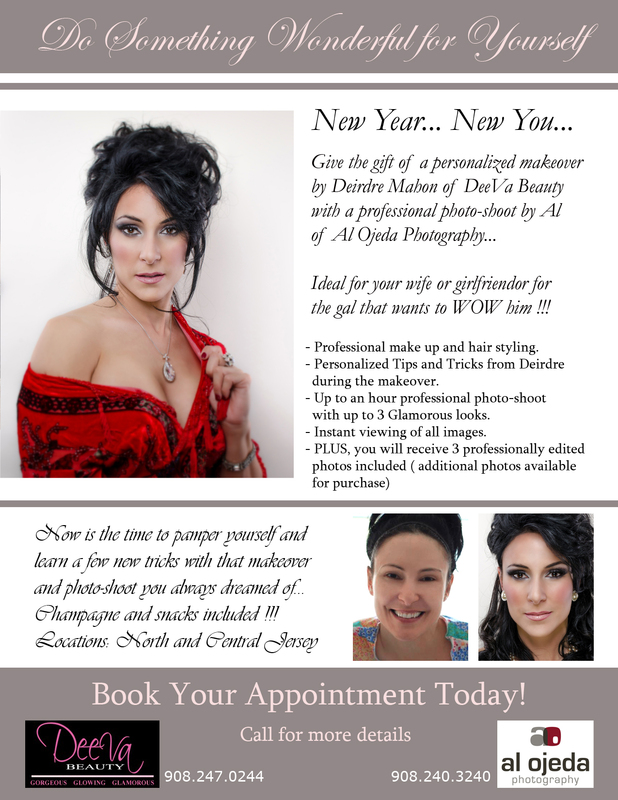 Al Ojeda Photography (photos) and DeeVa Beauty (make up) teamed up for this two pics of Tracey. Hair by Angela Serritella.